This is a great Chile Relleno dish – it has all the flavor and so very little work. It is super easy to put together and turns out a perfect little cup of Mexican goodness. Preheat oven to 400. Spray 8 six ounce or 4 10 ounce ramekins (small oven safe glass or ceramic pots) with Pam and place on a baking sheet so you can remove them from the oven easily. Whisk together eggs, egg whites, salt, pepper and milk. 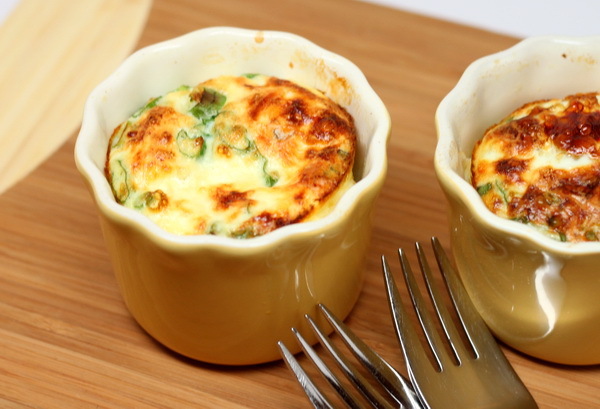 Place the chiles on the bottom of the cups then add corn and scallions Sprinkle with cheese then pour in the egg mix. Bake 35-40 minutes or until eggs are set. The larger the ramekins, the longer these will need to cook.